My momma makes me wear it. An makes me look a little foolish. That jingles when I run. I am her only son. To give her a happy Christmas Day. Forget that we were friends. Erase from me your memory. Let this be how our story ends. Forget those two nights of drinking. Rather than give into unspoken threats. Award shows, and reality T.V. Forget the snarky comments . . . Forget how we could be mean. When we glimpsed one another’s tales. When we both escaped our shells. Most nights for almost two years. Of music, animals, and pranks. And temporarily breaking the bank. Forget reaching for our phones. Despite living 300 miles apart. When we watched over each other’s hearts. You forgot that we were friends. Forget the closeness of our shared past. Let our story never have began. This is how our story ends. Come be with me at once! Do I see you born or drive him home? Until I found your mom’s hospital bed! She wouldn’t have had it any other way. Scolding me for being late. —A new life to begin. How gently he held thee. And wishes you to soar. Always staying ahead of the race. With your brother—be his guide. You’ll wish for more time with them to have had. It’s how you choose to pave your way. It’ll give you your head start. On days that feel somewhat blue. And promise to give you breaks. 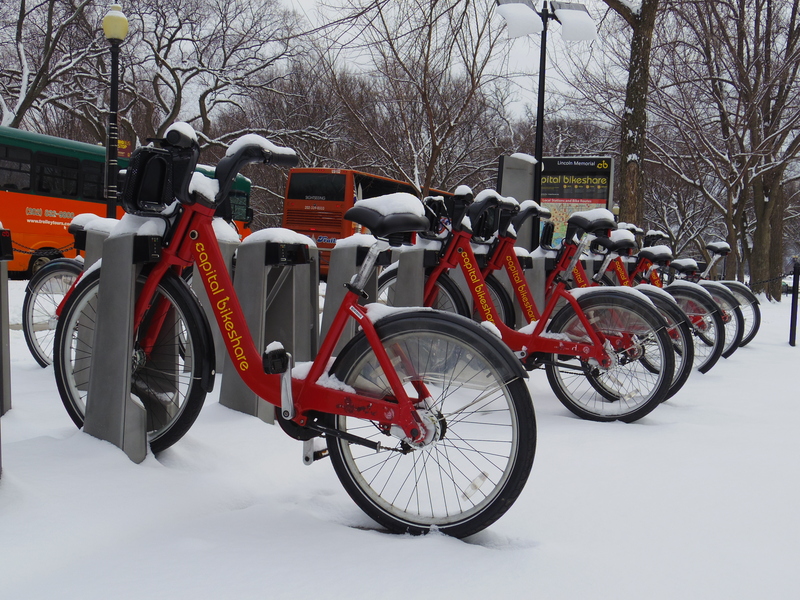 First Snowfall of 2015 in Washington D.C.
Three King’s Day 2015 coincided with the District of Columbia’s first snowfall of the year. To celebrate the feeling of living in a “Winter Wonderland,” I took photos of the National Mall during my lunch break. Here are the unfiltered, un-Photoshopped, un-cropped photographs. Then I took a walk from the Lincoln to the World War II Memorial, where I got an nice view of the Washington Monument. I figured I may as well visit the Vietnam and Korean War Memorials. The effect in the snow made me think “Beautiful Tragedy.” They both felt more solemn than normal. I ended my lunch break with a view of the Jefferson Memorial and Reagan National Airport. P.S. I don’t think anyone was planning on biking today . . . The third day my sister was here we woke up eager to check out the only museum on her “Must See” list. The Newseum. The original plan was to visit the Newseum then explore more of the National Mall, but we ended up spending six hours taking in American History and the History of the Press through the eyes of journalists. It became apparent that my sister, her bf, and I had different museum visiting strategies, so we split up right away and agreed to reconvene at lunch. We ended up meeting up at the end of the day. Honestly, I thought we might not make it in to the Newseum to begin with because my sister spent one hour reading the headlines. It was interesting to see how each state perceived what was Newsworthy. On this particular date it felt like most of Middle America’s front page news centered on football, whereas the coastal states featured news on the missing AirAsia plane or politics. A good portion of the Newseum was dedicated to the history of the press and its conflict with the government. The two need each other as much as they get in each other’s way, but probably the most enlightening part was how much the press and the people have worked together to affect political change. 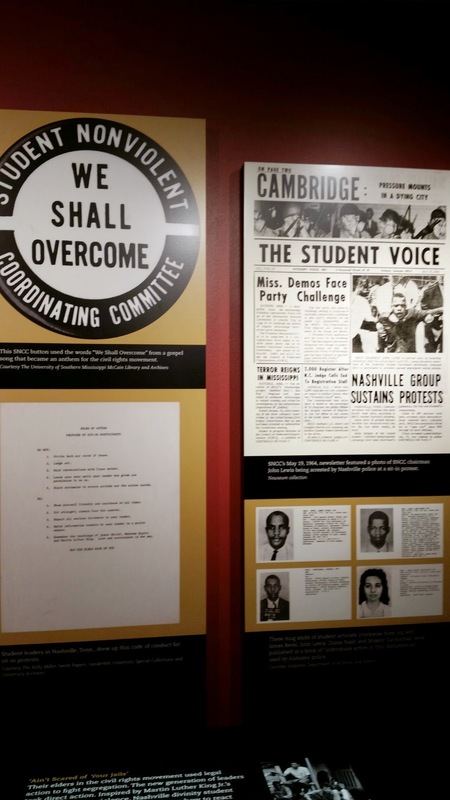 The headlines surrounding the civil rights movement were like a slap on the face. The actions taken by opponents to desegregation were barbaric. More interesting were the parallels between what happened then and what’s happening now with the Furguson Case. I probably spent an hour in this section. My high school American History class did not do this justice. Some of the articles made me sick to my stomach. Some of the visual aids were shocking. The one of a truck full of bullet holes showed the extent that journalists will go to to bring us a story. The truck made my stomach churn. The journalist in it survived that attack, but it left me wondering what type of person it takes to risk his/her life in order to bring the people a story. The museum makes a big deal about how journalist write our first drafts of history. I think that’s true. While the headlines might be sensational, the stories written this way gave me a different perspective on some major world events that my high school history classes glossed over. What do you think? Are journalist crazy to take these risks or are they unsung heroes to the people’s cause? For me, two of the most emotional exhibits centered around 9/11 and the Pulitzer Prize winners. I could only handle these exhibit for a few minutes at a time because it brought to life the hard decisions that photographers must make on a daily basis. It was interesting to see how different states and countries handled the headline treatment of the World Trade Center. Some of the headlines were sensitive and other’s were sensational, but they all made apparent the shocking news of the day. The story that got me the most was one of a photographer who was documenting starving children in Africa, and how his decision to not intervene eventually lead to him taking his own life. To contrast that one, there was one of a photographer who helped a Vietnamese girl who was fleeing from Napalm (after he took her picture). I only took a photo of one of my favorites picture, which is the one of a giant wave hitting a lighthouse. I finished my tour on a happier note with a tour of the Baby Boomer Generation. I stumbled upon this exhibit, which discussed the new culture of the Baby Boomer, or what I like to call, the suburb generation. We didn’t end up meeting up until the museum closed. Since it was cold out, we decided to explore the city a little bit and ended up at Ford’s Theater. We snapped some shots, then decided that it would be the next day’s activity. While my sister and her BF woke up full of energy on Monday morning, I was running a fever and didn’t have a voice. So, I stayed home and slept while they ran off to explore the Natural History Museum and later to get a better view of the White House. I met up with them at the Lincoln Memorial that night. They were freezing and ready to go home, but they appeased my request to take a few photos. Day 1. December 28, 2014 The Outcome of the Big Move: Part of the reason I’ve been feeling so sad. During the last couple of months of 2014, I was in a state of melancholy. I missed my friends, I missed New York, and while the decision to restart my career at step-one was the right one, I was already feeling the financial strains of taking on an entry level position. Starting over at 35 isn’t an easy thing to do . . . I imagine it’s a difficult step to take at any age. I always thought that by now I’d be co-habitating with a romantic interest, or maybe even be married, and that I’d have a least one adopted or foster child, a cat, and a dog. We’d both be professionals–me possibly a writer, him possibly a journalist, engineer, or politician, and that we’d be traveling the world non-stop. That was the dream. Instead I find myself living in Washington, D.C, with a roommate I met on Craiglsist, and two cats. I have no boyfriend and my only potential love interest lives too far away to be viable, and can I mention, again, how much I miss my friends? A life without a social life can be hard. Realistically, it’s not bad at all. I love where I live, I love my job, and I love the life I lead. Being new to this town, I’m still working on making friends. Luckily my roommate, his girlfriend, and a few of my colleagues have turned out to be a built-in support group. I have a friend from NY/RI who occasionally comes to visit, and the pickup soccer groups here are great. It’s just that some days I look around and feel like I’m living like someone in her early 20s, and it makes me sad because I then feel unaccomplished. I have to remind myself, regularly, that life is about the journey, and we all carve our own path in our own time. On the good days, I realize that my journey might be slower than other’s, but it’s taken me across the United States to live in some of our most historical places. It’s allowed me to meet some amazing people, and see sites and have experiences that some can only dream of. Moreover, with each move I’ve come away with a deeper understanding of what it means to be and have true friends. I’ve been blessed with a support group that has shown me the lengths people who love you will go through to make sure you’re all right. Sometimes it’s a phone call, sometimes it’s a surprise gift or card in the mail, sometimes it’s helping you move, sometimes it’s a last minute trip to visit you, and sometimes it’s a little bit of tough love, no more than a simple hug, a shoulder to cry on, or an ear to listen too. My Sister and Me My sister and I hadn’t spoken regularly in months. She works in the film industry, which means long hours for days and sometimes weeks or months at a time. Finding the time to talk isn’t easy, but somehow she sensed that I needed her company, so when her last show ended she surprised me with a visit. It wasn’t a total surprise. I mean, she tried to give me a few days notice for a weekend visit, but since I had the last week of December off of work, we (her BF and I) were able to convince her to postpone the trip for a couple of weeks, which was great, because I was able to spend an entire stress-free week with my one and only sister and here newest sidekick-Kiki. Opening Gifts My sister and her boyfriend arrived early on Sunday, December 27. I’d just gotten back from a weekend trip to NY and was running a low fever. I woke up in the early morning to pick them up from the airport and greeted her with a hug and an “I have some good news and some bad news. The good news is that I have a surprise waiting for you at home. The bad news is, I’m sick.” They were tired but excited. They were also disappointed that they hand’t been able to catch a glimpse of any of the monuments from the plane. “That’s because you flew into Dulles,” I told them, “But don’t worry. You’ll get to see them on the drive to the apartment. And they did. At the first glimpse of the Washington Monument, I thought they were both going to jump out of their seats. There will never ever ever ever be a feeling as great as seeing those two awestruck faces as we drove by it. Just as good was my sister yelping, “oh! oh! oh! is that the cemetery?” as we drove past Arlington Cemetery. And possibly better was her boyfriend’s frantic taps on her shoulder and animated facial expressions as we drove past the Pentagon.” Those were the first of many moments this week when I would come to realize just how special Washington, D.C. is. To me, it’s my home, but to others, being here is a dream come true. The first thing we did when we got to the apartment was to take a tour of the place, which they decided to call “The Hotel Hilton.” The second thing we did was exchange gifts. I don’t normally buy gifts for all of my siblings. We do a family Christmas exchange instead, but since she was visiting and I knew she wouldn’t adapt well to the “cold” weather, I decided to buy her something she could use during her stay. She surprised me with a gift too. But her’s was a result of a misunderstanding. About 10 or 15 years ago, my sister and I were watching a documentary about Jennifer Lopez. There was a scene where JLo was having someone flown in to do her nails, and during that scene my sister turned to me and said, “I want to be just like her one day.” That memory is etched in my mind forever. So much so that when JLo’s book came out, I sent my sister a link to it with a note that read, “If I ever get you for the Christmas exchange, I’m buying you this.” She read it as, “If you get me, get me this.” So I got the gift that I would’ve bought for her. Ha. ha. ha. Oh, andI kept it. Yup, she was embarrassed, but I loved it and the story that came with it. JLo is pretty damn cool too. I had planned to read the book before giving it to my sister anyway, so it all worked out. Our mother had also sent us both a gift which she said “are the same but different. You guys can decided who get’s what when you open them.” They ended up being bracelets that have protective powers. We tried them on and, after some deliberation, decided to each keep the one that we’d opened. Eating Tamales We our half Puerto Rican and half Guatemalan, which makes for an interesting blend of traditions. Growing up, Christmas was always more my dad’s holiday’s than my mom’s. We grew up opening gifts at midnight and eating the traditional Guatemalan tamales on Christmas Eve. My sister, who now lives in Puerto Rico, had been craving them all month. According to her boyfriend, she’d been talking about them non-stop for days. This is a food that doesn’t exist there, so she was in absolute heaven when I opened the fridge and said, “Here, these are for you.” Of course, we made her Puerto Rican boyfriend try one too. He decided they were delicious! (A special thanks to the NY family for cooking these up). Exploring the Capitol/The National Mall After taking a nap, we drove to the National Mall to see the sites. We spent five hours walking from the Capitol to the White House. I don’t think either of them realized just how much there was to take in. Here are some of my favorite shots of the Capitol. The Washington Monument Of course, a trip to D.C. is not complete without a walk to the Washington Monument, where they shared one of the world’s most romantic kisses. The night was cold, and we were hungry. So after that last kiss, we went to grab some pizza at the Pie, then headed home to sleep. I lived in New York for a little over six years, but it wasn’t until my third year that I fully appreciated the magical feeling the city brings to the season. Decorative trees stand tall at some of the city’s greatest landmarks. Ice rinks pop up at local parks, and store windows become fairy tale worlds. Here’s a glimpse at the 2014 season.